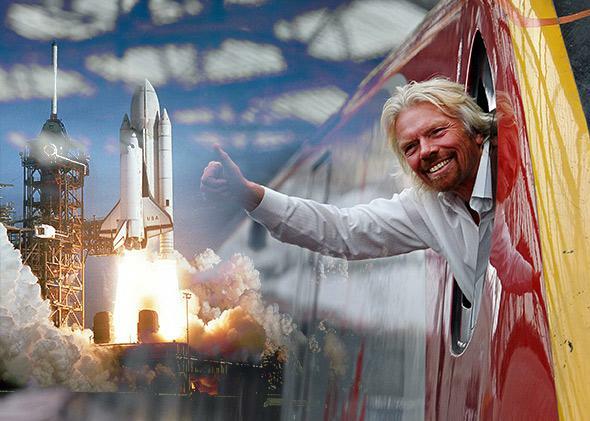 Billionaires’ private space rocket ships: Elon Musk and Richard Branson go nowhere new. Catapulting the very rich into space isn’t new, and it isn’t about exploration. Richard Branson, exploring the frontier of megalomania. It’s an old trick. Multimillionaires regularly try to spin acts of crass ego gratification as selfless philanthropy, no matter how obviously self-serving. They jump out of balloons at the edge of the atmosphere, take submarines to the bottom of the ocean, or shoot endangered animals on safari, all in the name of science and exploration. The more recent trend is billionaires making fleets of rocket ships for private space exploration. What makes this one different is that the public actually seems to buy the farce. Space buffs everywhere are acting as if everyone in the world will somehow be enriched when Lady Gaga is finally able to sip pink Cristal in zero gravity. Call it the trickle-down theory of space exploration: Somehow, building a luxury-liner suborbital rocket ship for the amusement of the ultrarich, ultrafamous, and ultrabored will be a great victory for all of humanity. The very word exploration implies an attempt to discover something new and interesting about the universe. But even the act of catapulting the very rich, instead of professional astronauts, into space has been done before. Multiple times. More often than you think. So how in the world did Richard Branson and his ilk convince us that putting Justin Bieber in orbit is an act of exploration? Back in 1783, or so the story goes, Benjamin Franklin was watching two men floating lazily around in a newly invented hot air balloon, when someone asked him why anyone should bother to build such a device. “What good is a newborn baby?” the diplomat famously replied. Snap! His rejoinder echoes down the ages, stopping the mouths of any Luddite narrow-minded enough not to see near-infinite potential in every new technology. This ethos runs deep in techie communities, and it has served them well. It’s a spur that drives innovation. Whenever you build something new and cool, you’re automatically creating something with great potential; by default, you’re doing something good for humanity by expanding our horizons and teaching us something new. Technological novelty is tantamount to exploration. And for the past two decades, entrepreneurs who have been trying to build their own startup spaceflight companies have been trying out novel technology. In the mid- to late 1990s, you had Pioneer Rocketplane, which was supposed to build a hybrid jet-rocket craft that could be lighter, and therefore cheaper, to fly than conventional rockets. Kistler Aerospace repurposed old Russian components and used a combination airbag-parachute system to allow parts to be reused over and over again, supposedly making it cheaper to fly than conventional rockets. Kelly Space & Technology was to use a rocket-powered airplane to get to the edge of the atmosphere before a second rocket stage lifted the payload into orbit, supposedly making it cheaper to fly than conventional rockets. Sometimes the proposed new technology was almost absurd. Rotary Rocket wagered its future on an improbable propeller-tipped craft that, somehow, was supposed to make it cheaper to fly than conventional rockets. In 1999, Dan Goldin, then head of NASA, derided these startup schemes as “system gimmicks” that dress up rehashed or implausible ideas as new and innovative. But the pretense was absolutely essential. Without some real novelty—or at the very least, a breakthrough in reducing cost or reliability of existing technology—the companies couldn’t tap into that exploration ethos. And it’s that ethos Elon Musk and Richard Branson are exploiting, with their promises of super-cheap industrial launchers and rocketplane thrill rides into space, to whip up such fanatical support. It’s almost as if Branson and Musk have figured out how to monetize brashness. Through sheer bravado, they’ve convinced us that they’re going to build something really cool, and we should all be grateful that they’re doing it. Imagine that Branson, with his brilliantly named SpaceShipTwo, succeeds at getting a few hundred celebrities into orbit—somehow, miraculously, not killing any of them. Even so, his plans for quarter-million-dollar rides, let alone a thriving orbital tourism industry, are unsustainable in even the near term. The math simply doesn’t add up. Unmanned rockets are much cheaper than crewed ones, and Branson’s planned unmanned rocket, LauncherOne, is supposed to cost $20,000 per pound to take cargo into orbit. It’s inconceivable that he can eventually build a crewed orbital space plane to do the same thing at one-tenth or one-half or even the same cost. This means that it will cost millions of dollars just to loft the avoirdupois of a single bulgy-eyed tourist; throw in life support and other safety equipment that will ensure passengers’ safe return, and we’re still talking tens of millions of dollars per human into orbit. (Which is more or less the going rate right now. Russia’s cost for space tourists is about $35 million; as marked-up as that price is, it’s a bargain compared with what NASA pays.) Neither Musk’s nor Branson’s goals really seem to break new ground, despite all the talk of exploration. Alas, building something cool is not the same thing as going somewhere we haven’t been before or learning something new. Technological novelty does not automatically mean revolution or even an appreciable commercial advance. Otherwise, the Concorde would be the standard for transoceanic travel rather than a little-mourned plaything of the rich and famous of yesteryear. There is one thing that is really new about the billionaires’ space club—and it’s hard to cast it as “exploration.” Since the dawn of spaceflight, rocketry has been the exclusive domain of governments or multibillion-dollar aerospace contractors, entities like Boeing and Lockheed. Now, it is within the ken of ultrawealthy individuals. Musk (with his $12 billion) and Branson (with his $5 billion) have amassed enough wealth to surpass the worth of smaller launch providers like Orbital Sciences. So it shouldn’t be any surprise that they can build working rockets. But as much as fans of the spaceflight startups like to see this as a David-challenges-Goliath story, it’s not. It’s really a David-becomes-Goliath story. And there’s one thing that recommends large corporations over the super-rich: At least corporations don’t have egos that need to be stroked.